At the gates of the ancient city of Arles famous for its arenas and ferias and soon for the famous Luma tower, 10 minutes from downtown, on a park of 8500 m², come and spend a few days of rest at the MAS MAURANE, in its gipsy trailer LA PITCHOUNE, isolated for the winter with heating, equipped with a fridge, microwave, kettle, coffee maker, hotplates, crockery, TV, etc. 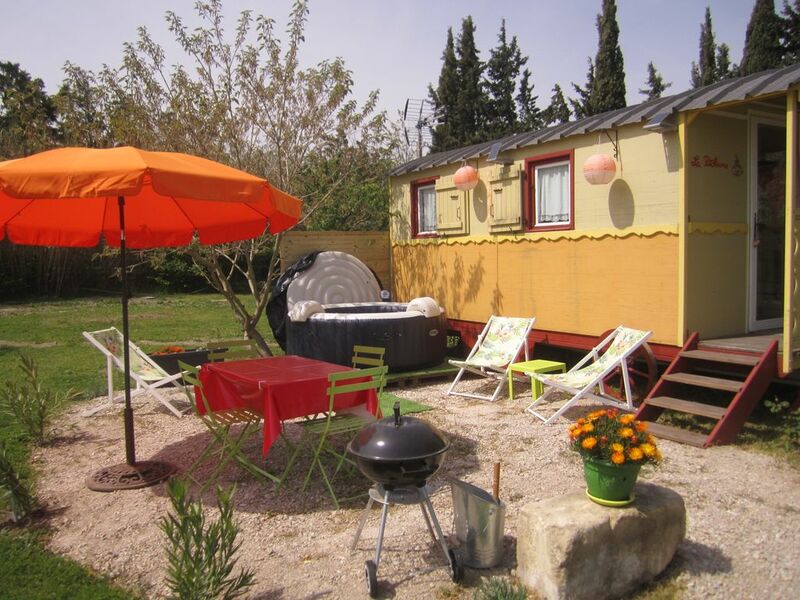 With an area of 18 m² this trailer for 3 people has a private terrace with garden furniture and barbecue. A private spa is reserved for the trailer on its terrace without vis-à-vis. It has a bed for 2 people in 140 and a bed of 80. The Mas Maurane offers its tenants a covered and heated swimming pool from May to the end of October. Private parking will receive your vehicle at the entrance of the estate. From May to the end of September: 125 € / 2 persons / night, free homemade breakfast. From October to the end of April: 110 € / night for 2 people breakfast offered. 15 € the additional person. On order before 17H00 you can have a meal tray for 50 € / 2 people with a bottle of wine. The tourist tax requested by the town hall is extra. While waiting for the pleasure to receive you you can have a glimpse of the place on the various photos. Unusual accommodation, private spa, total independence without vis-à-vis.